THE HERSCHEL HOARD: Top Ten Most Wanted Herschel Card Captured! The Hoard is proud to announce the capture of a card on its Top Ten Most Wanted list. This is the 1996 N.F.L. 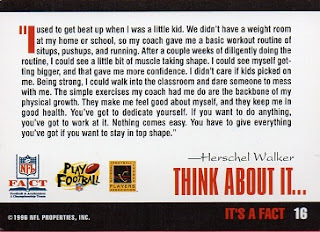 Properties It's a Fact card of Herschel Walker #16. To be honest, I didn't even know this card existed until the Trading Card Database put up an empty space for it on Herschel's 1996 page. 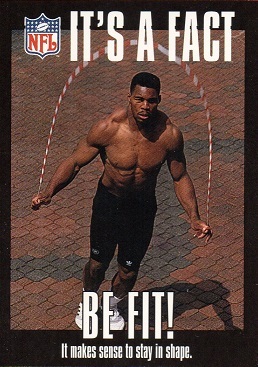 I already had the 1995 version, which is exactly the same as this card, except for the 1996 date on lower left of the reverse. Also, the picture on the front of the card showing Herschel jumping rope, is the same photo used on the 1993 Pro Line Profiles #597 card. This is the first on my Top Ten list that I was able to nab. An exciting find, and at a real steal. I have removed this card from the list at the right of this blog page, and replaced it with another Walker card I am seeking. That is the 1996 Summit Artist's Proof #133. 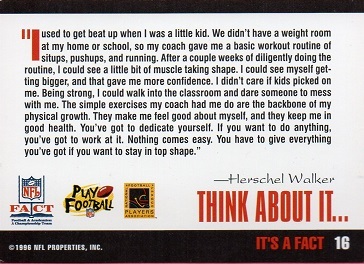 This card is #582 on my quest toward 600 different Herschel Walker cards.